I've had the original Book Of Ra slot here at GFM for a little while now and it's become the most popular game of all the slot machines on the site. But now that Novomatic have released the Book Of Ra Deluxe online - which is sometimes referred to as "Book Of Ra 2" - I have decided to add it as an option. It does look and feel slightly better and the Book Of Ra Deluxe has 10 paylines instead of 9 on the original, better graphics and smoother gameplay. Aside from Book Of Ra 2, other Novomatic slots that you can play from the Gaminator machines online include the very popular Dolphin's Pearl Deluxe, Lucky Lady's Charm and Reel King which, while not one of my favourites, is on a par in the popularity stakes here in the UK with Rainbow Riches, primarily due to their presence in land-based casinos and bookie shops. Book Of Ra 2 is also in most casinos here on the Super V+ Gaminator machins. At present, the Book Of Ra Deluxe version is exclusive to the online casinos listed above. Other deluxe versions of Novoline games added to GFM include (so far) Lucky Ladys Charm, the Dolphin's Pearl slot and the slightly disappointing Columbus Deluxe. I say disappointing only because I've never had a decent win off the feature so I am biased LOL. An interesting side-note on the 'RTP' (expected return) for the Book of Ra Deluxe version which is set to 94.26% according to the paytable. Although that is pretty much firmly in the middle compared to online slot games in general - and probably better than at land-based casinos too it's quite a bit less than Lucky Lady's charm which weighs in at 97% although the original Book Of Ra and teh Book Of Ra Deluxe now have identical RTPs (online, anyway). they didn't used to: the original had about 2.55 more than the Deluxe but they downgraded the original so it matched. Ah well. For a full list of currently available online games in the Novomatic Gaminator series check out the Novomatic slots website. 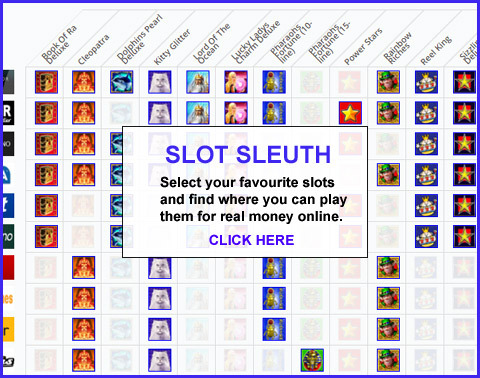 Many of the games that you see on the Gaminator, Multi Gaminator and Super V+ Gaminator slot machines in land-based casinos are now available to play online although there are still a few notable absentees from the list (Gryphon's Gold, Rich Witch, Egyptian Experience, Lions).